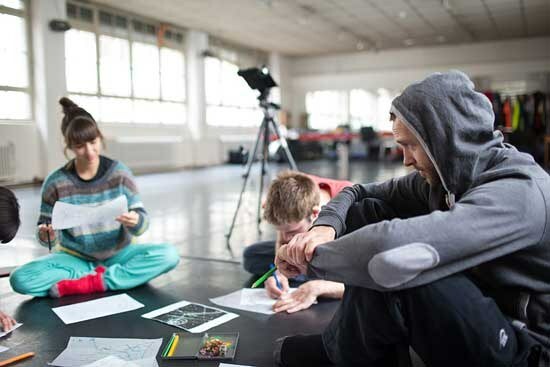 What’s behind the growing scientific curiosity among choreographers? Rehearsals for Gilles Jobin’s Quantum, created at CERN (3). Photos by Grégory Batardon, Courtesy Jobin. A bespectacled man draws a line in mid-air, as if extending a string from his chest. He retracts his hands, cupping them in front of his sternum, and flutters his fingers. With the flourish of one palm, he circumscribes an invisible sphere: elegant, swift, precise. You might almost mistake him for a dancer. In fact, he’s a physicist, one of several featured in Three Views of the Higgs and Dance, a short film created by Emily Coates and Sarah Demers at CERN, the world’s largest particle laboratory, near Geneva, Switzerland. As colleagues at Yale University, Coates, the director of the dance studies program, and Demers, a professor of physics, have teamed up in recent years to examine dance through the lens of physics and vice versa. The body language of researchers describing the Higgs boson—the elusive subatomic particle discovered at CERN in 2012—caught Coates’ choreographic eye. 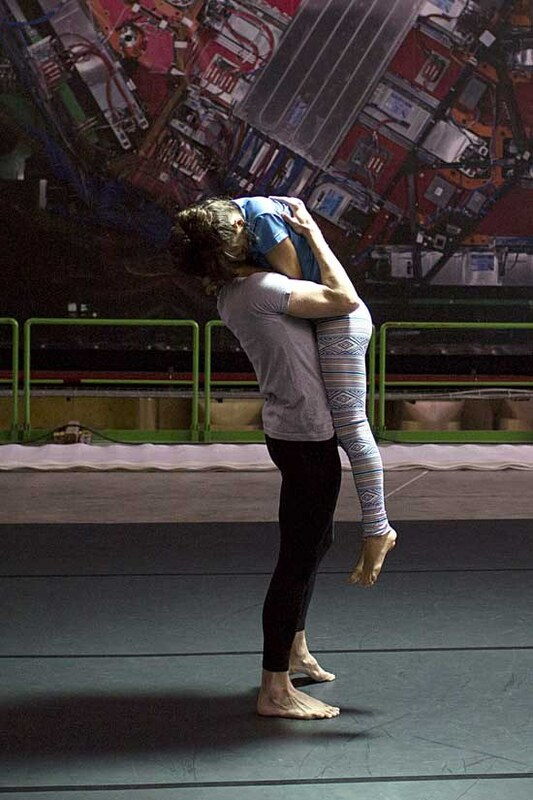 The collaboration between Coates and Demers, who have also developed a cross-disciplinary course at Yale called The Physics of Dance, is just one example of dance-science projects that seem to be proliferating lately, from Gilles Jobin’s 2013 Quantum, also created at CERN, to Jody Oberfelder’s participatory study of the human heart, 4Chambers, staged at a former hospital in Brooklyn earlier this year. In the past five years, artists from Jonah Bokaer to Miguel Gutierrez to Wayne McGregor have peered into the science of the brain, exploring memory and perception in relation to movement. Last fall in London, McGregor gathered more than a decade’s worth of his science-inspired research into a gallery exhibition, Thinking with the Body. That title might resonate with Jennifer Monson, another choreographer whose work has long bridged science and dance. And don’t forget Karole Armitage, who tackled relativity, string theory and quantum mechanics in her 2010 Three Theories and whose next production, premiering at the Museum of Natural History this spring, addresses global warming. The heart, the mind, the planet, the universe; realms both too small and too large to imagine: It’s no wonder choreographers are drawn from the studio to subjects more often examined in the lab. If a dancemaker’s most basic materials are the body, space and time, science offers ways of newly understanding and shaping all three. Of course, “dance” and “science” are massive fields that could interact in as many ways as there are species of sea life. As one of the first participants in Collide@CERN, a residency program founded in 2011 to support artist-scientist exchanges, Jobin turned to science for structure, using principles of particle physics to devise movement. “I wanted to find systems where the dancers could generate their own choreography in a very precise way—like rules of a game,” he says. “Particle physics is a lot about interactions and collisions, and I thought that inside those I could find some system to apply to our scale.” That approach didn’t quite pan out. “The problem with particle physics is you’re talking about the smallest of the small,” he adds, “and the rules that apply on that scale have nothing to do with the rules we apply on our scale.” But his conversations with physicists unveiled other ideas—about gravity and electromagnetism, for instance—that gave rise to choreographic devices. He stresses that Quantum, for six dancers, is not about physics. (“You’re not going to learn anything about particle physics by looking at it.”) Science is a means to the end of dance. For others, like Jennifer Monson, the opposite is true: Dance is, among many things, a prism through which to appreciate the natural world. In BIRD BRAIN, developed with environmental scientists between 2000 and 2006, Monson followed the migratory routes of birds and gray whales across large stretches of space and time. BIRD BRAIN: Ducks and Geese Migration, for example, took her from Texas to Minnesota over 10 weeks, with around 30 site-specific, outdoor performances along the way. That investigation continues to inform her current project, Live Dancing Archive. Right: Jennifer Monson’s BIRD BRAIN: Ducks and Geese Migration performance in Minneapolis. Photo by Cameron Wittig, Courtesy Walker Art Center. For the audience, too, BIRD BRAIN wasn’t so much about dance itself. “I was really thinking of the dancing as a vehicle to experience the environment,” Monson says. Behind every dance-science collaboration is the potential for creative breakthroughs, the kind that can only come from a fresh perspective on one’s own field. 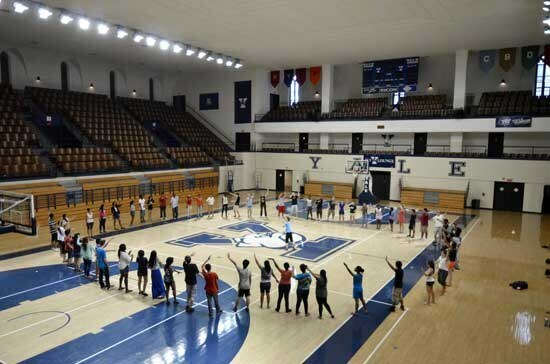 In 2004, Monson established iLAND (the Interdisciplinary Laboratory for Art, Nature and Dance) to encourage what she calls “hybrid processes” between life scientists and movement artists. 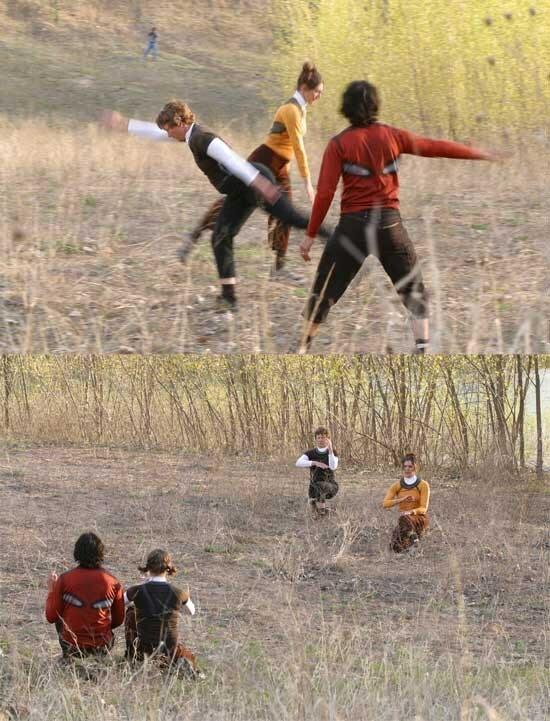 All are encouraged to delve into the others’ methods and practices: Choreographers dissect fish; botanists dance. “We talk a lot about how exciting it is to be a beginner at one thing when you’re an expert at something else,” Monson says. At Yale, Coates and Demers similarly keep disciplines in flux. Their Physics of Dance course—and the forthcoming textbook they’re co-authoring based on their curriculum—involves as much movement as math, both in and out of the classroom. One unit, for instance, “looks at angular momentum and torque in relation to the ways in which Balanchine, as if he were a physicist, really brilliantly altered the pirouette,” Coates says. Above: Emily Coates and Sarah Demers lead a workshop: “Discovering the Higgs through Physics and Dance.“ Photo by Mike Marsland, Courtesy Coates. “When we started planning the course,” says Demers, “one of our basic principles was to place physics and dance on equal footing, meaning we wouldn’t use dance to teach physics exclusively or vice versa. We were interested in diving into both disciplines with real integrity. Siobhan Burke is a dance critic for The New York Times.